Chelsea Johnson has been focused on “making a difference” since arriving on the Lawrence University campus in the fall of 2010. Her efforts have not gone unnoticed. The Lawrence University junior from Avon, Ind., has been named one of only 50 national recipients representing 43 colleges of a $5,000 Udall Scholarship. Selected from among 488 candidates. Johnson was one of only two scholars chosen from a Wisconsin college or university. Awarded by the Arizona-based Morris K. Udall and Stewart L. Udall Foundation, the scholarships are awarded to students committed to careers related to the environment, tribal public policy, or Native American health care. For the past two years, Johnson has served as president of Greenfire, the campus student environmental organization and is also the current student liaison to the campus’ Green Roots committee. She co-founded the Magpie, a once-a-term, student-run thrift store that collects used clothing and books for resale, with the proceeds used to support various national and international environmental groups. “The idea behind the Magpie is to raise awareness on the clothing consumption industry, which encourages fast fashion at the expense of the environment and human rights,” said Johnson, who spent the 2012 fall term on the Sea Semester program, which included six weeks living on a sail boat in the Caribbean. As a freshman, she helped organize a group of student volunteers to help out at local cat shelter and has been active as a “buddy” in Lawrence’s LARY tutoring program. As a Udall Scholar, Johnson will participate in a four-day Scholar Orientation Aug. 7-11 in Tucson, Ariz., where she will meet with environmental policymakers and community leaders as well as other scholarship winners and program alumni. Johnson is Lawrence’s fifth Udall Scholarship recipient in the program’s 17-year history, joining Hava Blair (2012), Stephen Rogness (2003), Gustavo Setrini (2001) and Jacob Brenner (1999). 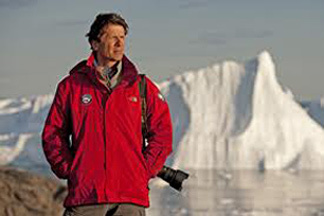 Acclaimed photographer James Balog, who has chronicled the natural environment for three decades for National Geographic, discusses his climate change project “The Extreme Ice Survey” Tuesday, April 17 at 7 p.m. in Lawrence University’s Warch Campus Center. Combining art and science, Balog creates innovative, dynamic and sometimes shocking interpretations of the world’s fast-changing landscapes, plants and animals. In 2005, Balog founded the Extreme Ice Survey (EIS) to document the impact of global climate change. The most wide-ranging, ground-based, photographic study of glaciers ever conducted, the EIS employed 27 time-lapse cameras at remote sites in Greenland, Iceland, Nepal, Alaska, and the Rocky Mountains, recording nearly one million photographs that reveal the extraordinary ongoing retreat of glaciers and ice sheets, and providing visual evidence vital to scientists studying glacier dynamics. National Geographic showcased this work in the June 2007 and June 2010 issues and the EIS project was the focus of the 2009 NOVA documentary “Extreme Ice.” It also was the subject of the feature-length documentary, “Chasing Ice,” which premiered at the Sundance Film Festival in January of this year. Balog’s appearance is co-sponsored by Green Roots, the Fox Cities Book Festival, and Renewegy. Mark Breseman '78, director of Björklunden (far left), and former Lawrence President Rik Warch, current chair of the Björklunden Advisory Committee, accept a rebate check from Bill Plamann, energy advisor for Focus on Energy, and Kevin Pitts, account management consultant for Wisconsin Public Service (far right). 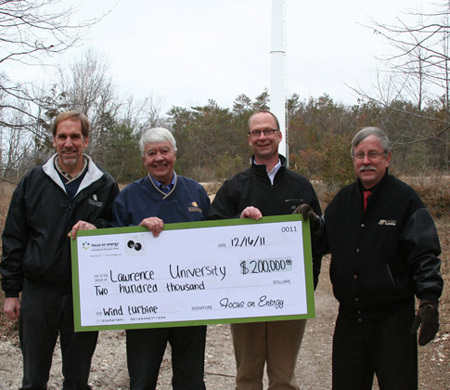 Lawrence University recently received a $200,000 rebate from Wisconsin Focus on Energy and Wisconsin Public Service for a 120-foot tall, 50-kilowatt turbine installed at Björklunden, the college’s 425-acre “northern campus” outside Baileys Harbor. Lawrence’s first investment in wind energy, the $400,000 turbine is expected to generate enough electricity to cover nearly one-half of the electrical needs of the 37,000-square-foot lodge on the estate. An independent study project undertaken by Steve Schnorr ’10 was the impetus for the turbine, which became operational in early December. Lawrence’s utility bill and carbon footprint both will get a little smaller thanks to the recent installation of a 20-kilowatt solar panel on the roof of Hiett Hall. Through the efforts of Green Roots to secure funding for the project, approximately $65,000 of the solar panel array’s $77,000 cost was covered by grants and rebates from WE Energies, Wisconsin Focus on Energy and Solar Innovations Inc. The estimated payback on the project’s initial investment is approximately six years with an expected useful life span of the panels of 30-40 years. The Hiett Hall installation is the second solar panel array on campus. 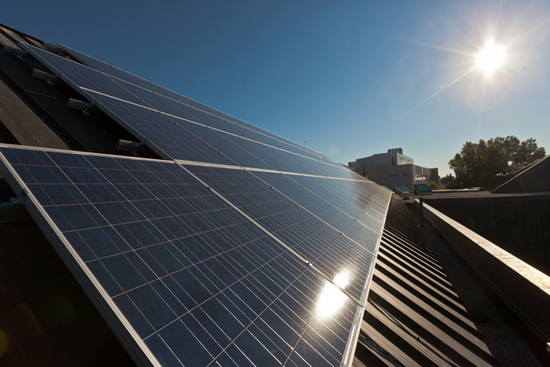 Lawrence first tapped the sun’s rays in 2010 with a 2.92-kilowatt solar unit on the roof of Youngchild Hall. That panel, which was installed primarily as an educational tool for environmental studies courses, already has generated more than 4,700 kilowatt hours of electricity while reducing the college’s carbon dioxide production by nearly five tons. Lawrence University is one of the country’s most environmentally responsible colleges according to The Princeton Review. Developed in partnership with the U.S. Green Building Council, the “Guide to 286 Green Colleges” is a comprehensive guidebook focused solely on institutions of higher education that have demonstrated an above average commitment to sustainability in terms of campus infrastructure, activities and initiatives. The guide profiles the nation’s most environmentally-responsible campuses and highlights each institution’s ecological commitment based on several criteria, including the USGBC’s LEED green building certification program, use of renewable energy resources, formal sustainability committees and recycling and conservation programs. Lawrence was cited in the guide for its Green Roots program, a two-year-long environmental initiative launched in 2008 designed to establish a framework to develop institutional policies and procedures to promote environmental awareness on the campus. Other factors in Lawrence’s inclusion in the Green Guide included the Warch Campus Center’s LEED Gold certification, the student-run sustainable garden that provides fresh produce to the dining hall, the composting of all food prep waste and the college’s vibrant environmental studies program that draws faculty from 11 different departments and focuses on research projects that lead to solutions for real world environmental problems. More recently, Lawrence installed its first solar panel and placed ninth nationally among 346 colleges in the 2010 Recyclemania competition’s per capita recycling category. The 286 schools included in the guide were selected on the basis of their 2009 “Green Rating” scores in The Princeton Review’s annual college guidebook. The “Green Rating” is a numerical score from 60–99 based on several data points developed in conjunction with the USGBC. Lawrence’s green rating was 83. According to a recent survey conducted by The Princeton Review, 64 percent of college applicants and their parents indicated information about a school’s commitment to the environment would impact their decision to apply to or attend it. 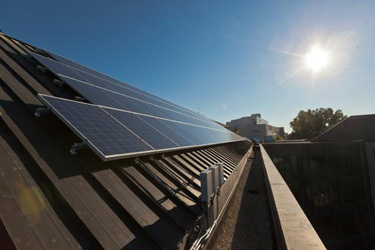 In commemoration of the 40th anniversary of Earth Day and in conjunction with its two-year Green Roots initiative, Lawrence University is installing the campus’ first solar panel on the roof of Youngchild Hall. The multi-day installation is expected to be completed on Earth Day, April 22. The 2.92 kilowatt (kW) unit, composed of 14 panels each roughly 3’ x 6’ — the size of a typical residential unit — is expected to generate approximately 3,700 kilowatt hours (kWh) of electricity a year. “Although the direct impact on our carbon footprint will be small, the educational value and the potential to learn more about the feasibility of additional installations on campus will be invaluable,” said Clark. The panel installation is due in large part to the efforts of freshmen Will Meadows and Austin Federa, who together conducted extensive background research and secured funding for a professional site assessment. Meadows and Austin also applied for and were awarded funding through Wisconsin’s Focus on Energy program and WE Energies, which covered nearly 60 percent of the unit’s purchase price. Northwind Renewable Energy from Stevens Point is conducting the panel installation. A 1973 Lawrence graduate, Wyeth is spending Term III as Lawrence’s Stephen Edward Scarff Memorial Visiting Professor in the government department, where he is team-teaching the class “Environmental Politics” with professor emeritus Chong-do Hah. The Scarff Memorial Visiting Professorship was established in 1989 by Edward and Nancy Scarff in memory of their son, Stephen, a member of the Lawrence class of 1975, who died in an automobile accident in 1984. It brings civic leaders and scholars to Lawrence to provide broad perspectives on the central issues of the day. Swept into office on the promise of change, President Obama has found that promise difficult to fulfill, even with the advantage of Democratic majorities in both houses of Congress. Wyeth offers first-hand perspective from inside the EPA on how change efforts have progressed under President Obama, where change has or hasn’t occurred and what barriers have stifled change. He also will discuss the gradual decay of the process for orderly transition from one administration to the next and its consequences for effective government. At the EPA, Wyeth tests and promotes innovative approaches to environmental protection within the EPA, states and business as the county transitions to a “green economy.” He has played a lead role in overseeing the use of Lean Manufacturing and Six Sigma strategies to achieve environmental improvement, streamlined EPA’s administrative processes and developed agency strategies to promote the use of sustainable products. After graduating from Lawrence with a bachelor’s degree in government, Wyeth earned a master’s degree in public policy from the University of California, Berkeley and a law degree from Yale Law School. Prior to joining the EPA in 1989, Wyeth spent three years as a staff member in the Wisconsin State legislature working with the Joint Finance Committee and practiced law from 1982-89 with a Minneapolis law firm. • Yoram Bauman, professor of economics at the University of Washington and a touring “stand-up” economist, “Comedy, Economics and Climate Change,” Monday, April 26, 7 p.m.
• Lee Paddock, associate dean for environmental studies and professorial lecturer in law at George Washington University Law School, “Environmental Change: A Legal Perspective” Monday, May 10, 7 p.m.
“The Climate for Climate Change” lecture series is sponsored by the Mojmir Povolny Lectureship in International Studies. Named in honor of long-time Lawrence government professor Mojmir Povolny, the lectureship promotes interest and discussion on issues of moral significance and ethical dimensions.